With a nihilistic wild man in the White House, it is time for America’s diplomats to embrace their historic rebelliousness. Fortunately for the republic, few American diplomats are likely to do either. As I demonstrate in my current book project, Rogue Diplomats: The Proud Tradition of Disobedience in United States Foreign Policy, America’s overseas representatives have always been an obstreperous lot. They have felt free, time and again, to ignore commands that ran counter to their own judgment and to trust posterity for vindication. 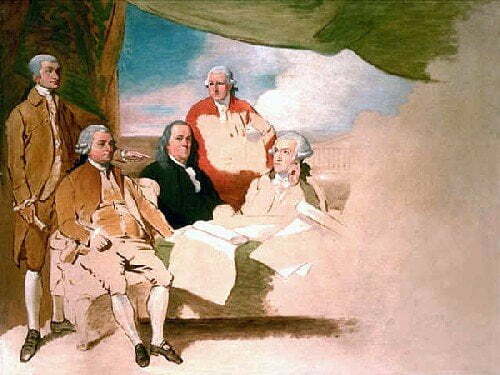 Indeed, American independence was founded, to a considerable extent, on diplomatic insurgentism, as Benjamin Franklin, John Adams, and John Jay disregarded orders from the Continental Congress to place themselves under French control during the deliberations leading to the end of the Revolutionary War. Aware that the French Foreign Minister sought to confine the infant United States east of the Appalachians, and certain that they could persuade war-weary British agents to agree to the Mississippi River as a western boundary, the three U.S. commissioners drew up and signed Anglo-American articles of peace without even informing Versailles that negotiations toward that end were underway. Similarly, the two largest land acquisitions in U.S. history, the 1803 Louisiana Purchase and the 1848 Mexican Cession, came about because a diplomat disobeyed orders; in the latter case, special envoy Nicholas Trist hammered out the Treaty of Guadalupe Hidalgo after having been fired by President James K. Polk. A maverick diplomat likewise preserved the so-called ‘special relationship’ between Washington and London in the lead-up to U.S. belligerency in World War I. Ambassador Walter Hines Page consistently misrepresented State Department protests about British maritime policy, often altering the language to such a degree that his hosts dismissed the complaints as slaps on the wrist. Thanks to Page’s efforts, Anglo-American relations, strained almost to the snapping point between August 1914 and April 1917, never ruptured entirely. These and other watersheds in the history of U.S. geopolitics—the survival of Franklin Roosevelt’s Good Neighbor Policy toward Latin America during the interwar period, the casting off of the Ngo Dinh Diem incubus in Cold-War South Vietnam, the restoration of Haitian democracy at the turn of the twenty-first century—derived in great part from the refusal of diplomats to follow the instructions given them by their superiors back home. This pattern of defiance is unique to the United States. No other nation’s diplomatic corps can claim such a remarkable record of subordinates breaking ranks. Were Trump the leader of Great Britain, France, Germany, Japan, China, or Russia, he could be more confident that his policies would become practice. As matters stand, though, he will encounter tremendous resistance from ambassadors, envoys, and other diplomatic agents as he seeks to redefine America’s role in the world. There is already evidence of such pushback. South Carolina Governor Nikki Haley, during her Senate Foreign Relations Committee confirmation hearings as U.S. ambassador to the United Nations, challenged Trump on several issues, including the relevance of NATO and the extent of Russian interference in the 2016 election. Furthermore, after taking up her post at the UN, she affirmed U.S. commitment to the two-state solution despite the president’s oft-voiced ambivalence, and she flatly contradicted Trump with regard to Putin’s annexation of Crimea. Trump had mused on the campaign trail that he might remove sanctions on Russia and recognize the illegal land grab, but Haley said no, announcing that sanctions would not end until Crimea was returned to an independent Ukraine. When a reporter pointed out the policy differences between her and her boss, she responded pugnaciously: “Look, he’s the president. He can say what he wants whenever he wants, but the direction we’ve gotten is to do our jobs, make sure that the United States is strong, and that’s what we’ll do.” The language was not as elegant as that contained in the diplomatic correspondence of the Revolutionary War, but in terms of the sentiments expressed, Haley was in effect reading from a script written over two centuries earlier by Franklin, Adams, and Jay. Adams’s sentiments were not unique to the early national period. The first five or six generations of Americans generally viewed diplomacy with suspicion and distaste. Complaints about its corrupting effects abound in the congressional record. In 1834, during Martin Van Buren’s presidency, a southern legislator insisted that diplomacy “spoil[ed] the good republicans we send abroad,” that U.S. diplomats came home “with their heads as full of kings, queens, and knaves as a pack of cards,” and that the “brilliant, gaudy, laced, jeweled, and plumed finery” of foreign courts was “unsuited to an agricultural, distant, peaceful people.” A quarter-century later, Representative Jabez Curry of Alabama said of the U.S. diplomatic corps, “Here is the evil, the fungus, the excrescence, a pinchbeck imitation of the pomp and pageantry of royalty, and we should put the knife to it and cut it out.” Thirty years after that, New York Senator William Robinson called diplomacy “an ulcer on the body of republicanism” and demanded that the “fops,” “profligates,” “snobs,” and “dandies of our diplomacy” be “quarantined as we quarantine foreign rags through fear of cholera” upon reentry to America. Their “offensive and polluting influences,” Robinson proclaimed, left “a stench in the nostrils of the American people.” This reflexive association of diplomacy with contamination persisted in the halls of Congress until the early twentieth century, and to a considerable extent even beyond then. Americans’ distaste for statecraft led Congress to starve the United States’ diplomatic arm of capital, with the result that only wealthy men, men whose principal means of support lay in the private sector, or men intending to serve for a short time could accept foreign appointments. For eighty years after the Declaration of Independence, America’s ministers scarcely drew salaries. They also received little in the way of expense accounts, being expected to dip into private fortunes to pay for housing, food, transportation, clerical help, and entertainment. Thomas Jefferson went bankrupt as a result of his diplomatic outlays while U.S. representative to France. John C. Calhoun declined offers to assume the top diplomatic post in Paris—not because he did not want the assignment, he explained, but because he could not afford it. The same conditions obtained for the most part during Woodrow Wilson’s administration, when Charles Eliot, former president of Harvard, and Richard Olney, former secretary of state, refused diplomatic appointments on financial grounds. Congressional parsimony ironically led to the United States developing a first line of defense that was more aristocratic and class-bound than that fielded by London, Paris, or Madrid. This had momentous consequences. America’s diplomats did not feel as beholden to the government they served as did the representatives of other countries. The rich and prominent American lawyers, soldiers, politicians, journalists, educators, or businessmen who lent prestige to an administration by performing important diplomatic duties often concluded that their principal obligation was to their country rather than to the president. They therefore disregarded directives that they felt conflicted with the national interest. For example, the U.S. commission that forged an end to America’s quasi-war with France in 1800 ignored John Adams’s insistence that they demand compensation for seized American ships because they decided that the United States would have to drop its financial claims against Paris if there was to be peace. Likewise, when Henry Clay, John Quincy Adams, and Albert Gallatin confronted an inflexible British delegation at Ghent toward the close of the War of 1812, they declined to insist that London stop impressing sailors from American vessels on the high seas, even though James Madison had made abandonment of this policy the sine qua non of any agreement. For obvious reasons, U.S. diplomats became even more brazen after Andrew Jackson introduced the practice of rotation in office. A campaign contributor or ward heeler who received his ministership as a patronage plum when his party took power was likely to assume that the president owed him, not the other way around, and to interpret presidential instructions as friendly suggestions from a peer rather than inflexible orders from the commander in chief. Hence, when Jackson fired Minister to Mexico Anthony Butler in 1834, Butler took no notice of the recall order and remained at his post for months, repeatedly attempting to purchase Texas despite having no authority to do so. Elijah Hise, sent to Central America by James K. Polk in the late 1840s to negotiate commercial treaties with Guatemala and El Salvador, instead signed a treaty with Nicaragua giving the United States the right to construct a canal or railway through that republic’s territory, an act that grossly exceeded his instructions. William Brent, Polk’s representative in Buenos Aires, offered to mediate a dispute between Argentina and Paraguay even though Secretary of State James Buchanan told him numerous times that this was not administration policy. Butler, Hise, and Brent flouted orders to a degree undreamt of in the foreign services of other nations, where, according to a nineteenth-century British commissioner, “We consider ourselves as little more than pens in the hands of the government at home.” U.S. diplomats had a more expansive understanding of their function. Another source of diplomatic indiscipline, related to the spoils system and the tight-fistedness of Congress, was the non-professionalism of U.S. foreign policy. Whereas candidates for diplomatic work in Europe and elsewhere had to pass competitive examinations, entered their countries’ services at the lowest grade, were promoted on a merit basis, and continued practicing statecraft in some capacity until reaching retirement age, American diplomats were, throughout most of U.S. history, novices. There were no formal qualifications for diplomatic jobs in the United States, no criteria by which to judge an applicant’s competence. A man could receive senatorial confirmation as a diplomat without knowing the language of the nation to which he was assigned or understanding anything of its history and customs. He usually took up his post late in life after having distinguished himself in another field. In many cases, he was appointed for a single task, like negotiating a treaty, and he expected to return home after completing it. Such an arrangement made it difficult for presidents or secretaries of state to force a diplomat into line by threatening him with dismissal. That prospect held little fear for men who did not depend on the federal government for their livelihood. Congress did take some steps toward placing diplomacy on a career footing after the outbreak of the Great War. The 1915 Stone-Flood Act extended the merit principle of the Civil Service (Pendleton) Act of 1883 to the diplomatic service, mandated qualifying examinations for appointment, and set up a board of examiners to evaluate candidates. It also provided for promotions within the service on the basis of demonstrated skill. Postwar distresses, mostly of an economic nature, prompted Congress to pass a supplementary bill in 1924: the Rogers Act consolidated the diplomatic and consular branches into a single foreign service, established a school in the State Department for the instruction of candidates who passed the qualifying exam, authorized higher salary scales, and made provisions for retirement and disability. Other bills intended to professionalize U.S. statecraft—the 1931 Moses-Linthicum Act and the Foreign Service Acts of 1946 and 1980—removed some barriers keeping non-wealthy Americans out and overhauled the examination process to ensure that it did not favor candidates who had been educated at exclusive private schools and colleges. These were all significant reforms, but they failed to change matters at the highest level of diplomatic representation: the ambassadorships. Officers at that rank could still be appointed for reasons other than demonstrated competence over a long tenure of service. They could, that is, be rank amateurs, and many of them were. Thus in the fateful period leading up to U.S. belligerency in World War II, nearly all of FDR’s ambassadors in vital countries were dilettantes: Joseph Kennedy in London, Jesse Straus followed by the unstable William Bullitt in Paris, Claude Bowers in Madrid, and William Dodd in Berlin. (Only the U.S. ambassador in Tokyo, Joseph Grew, was a career diplomat.) Averell Harriman, Harry Truman’s ambassador to Moscow at the dawn of the Cold War, had no diplomatic training. Two of the most important ambassadors to Saigon during the fateful period of U.S. military escalation in Vietnam, Henry Cabot Lodge and Maxwell Taylor, did not owe their appointments to merit recruitment and promotion. Not coincidentally, all of these men, especially Kennedy and Lodge, disobeyed orders while representing the United States abroad. Typical American rogue diplomats, they struck out on courses that they knew were contrary to Washington’s wishes but that they felt were in the best interest of their country. The United States needs some of that defiance today. As it becomes ever more apparent that President Trump has no grasp of the complex and dangerous problems that confront America in the international arena—and no ability to frame a consistent geopolitical strategy—the preservation of peace in a range of global hot spots will increasingly depend on those individuals whom Lewis Bollard calls “the bearers of the American eagle abroad.” U.S. envoys have already had to walk back some of Trump’s more irresponsible statements, such as his threat to impose a 20 percent border tax on Mexican products shipped into America and his demand that Seoul foot the billion-dollar bill for the U.S. anti-ballistic missile system Washington wants to place in South Korea. Perhaps the most reckless and inflammatory pronouncement Trump has made while president, his vow to move the U.S. Embassy in Israel from Tel Aviv to Jerusalem, will require months of meticulous diplomacy to undo. More broadly, American diplomats will have to bend every effort to counteract the overall thrust of Trump’s foreign policy, which, insofar as one can discern coherence in his contradictory statements and repeated changes of mind, seems to incline away from the open, rules-based world so painstakingly built up over the past seventy years and towards a return to a spheres-of-influence arrangement in which strong countries like Russia, China, and the United States bully their weaker neighbors with impunity. ‘Winner take all’ and ‘might makes right’ are clearly maxims with great appeal to Trump—one could argue that he has lived his whole life by them—but they are not conducive to the kind of international order that has allowed America to become the planet’s sole superpower. Will America’s diplomats save U.S. foreign policy from Trump? There are reasons for optimism. Many of the features of American diplomacy that encouraged insubordination in the past are with us today. The United States is still the only first-world nation on earth where a large percentage of key diplomatic posts are held by non-career men and women. Presidents continue to appoint individuals as ambassadors who owe their jobs to factors other than their previous documented fitness to discharge diplomatic duties. Apart from their pecuniary support for the right candidates, super-donors receive ambassadorial appointments for another reason, one that would be familiar to Thomas Jefferson and John C. Calhoun. Because Congress is still notoriously tight-fisted when it comes to providing funds for representational entertaining—the parties, banquets, and other events that an ambassador is expected to host—a rich ambassador-wannabe willing to dig into his or her own fortune to cover the costs of such festivities has an advantage over applicants of more modest means. In 2013, when ambassadors earned a maximum base salary of $179,000, they had to spend hundreds of thousands of dollars a year at certain posts wining and dining foreign elites. Thus, when Obama signaled his intention to nominate ex-congressman Timothy Roemer as ambassador to India, Roemer asked the president not to put his name forward. Roemer later informed the New York Times, “I told the White House and the State Department [that] I can’t afford a job like that.” The financial requirement for high diplomatic service remains a distinctive feature of U.S. foreign policy. Not all non-career ambassadors buy their appointments. Some receive them because of a personal relationship with the president. William Wilson, who became friends with Ronald Reagan when the latter was a movie actor and pitchman, was named first U.S. ambassador to the Holy See by President Reagan in 1984. George W. Bush nominated his former college roommate, Robert Johann Dieter, to head the U.S. Embassy in Belize in 2005. Dieter was succeeded in 2009 by Vinai Thummalapally, who had shared a dorm room with Barack Obama at Occidental College. Crystal Nix-Hines, named U.S. ambassador to the United Nations Educational, Scientific, and Cultural Organization in 2014, earned her undergraduate degree at Princeton, where she befriended the future Michelle Obama, and then attended Harvard Law School with the future President Obama. All of these individuals lacked any significant background in international affairs at the time they were sworn in as ambassadors. They got their positions because of the belief, more widespread in American policymaking circles than in the foreign services of other countries, that the president benefits from having friends in charge of U.S. embassies, that such an arrangement ensures loyalty and candor, and that these qualities are often more important than ability. Then there are the political appointees, those party stalwarts who receive ambassadorships as consolation prizes or thank-you gifts. Embassy Tokyo has served both functions. Former Vice-President Walter Mondale, cast into the political wilderness for eight years after his defeat by Reagan, became U.S. ambassador to Japan when the Democrat Bill Clinton took office in 1993. Mondale’s successor, also appointed by Clinton, was the just-defeated former speaker of the House, Tom Foley. Caroline Kennedy, who enhanced Obama’s prospects for victory in the 2008 election by writing an op-ed piece for the New York Times in which she compared the then-senator from Illinois to her father, obtained the Tokyo ambassadorship under President Obama. While one might argue that Mondale and Foley at least had valuable administrative and governmental experience, Kennedy lacked even that, aside from her work on the boards of various nonprofit organizations. None of the three ambassadors spoke Japanese. In any great-power country except the United States, they would never have been trusted with such responsibility, but Washington has its own criteria for selecting diplomats. Friends, fundraisers, lobbyists, bundlers, and wheelhorses repeatedly beat out career men and women to represent their nation overseas, and, once installed in their posts, they often act with far greater license than their foreign counterparts. This haphazard system seems a recipe for disaster, and it has received more than its share of ridicule, notably in a recent book with the arresting title The Foreign Circus: Why Foreign Policy Should Not Be Left in the Hands of Diplomats, Spies, and Political Hacks. Comparisons with the U.S. military are irresistible: it is hard to imagine the American people or their representatives in Congress tolerating the practice of four-star generals or admirals being chosen from the ranks of campaign contributors. Yet the American approach to diplomacy has turned out much better than one might expect. Talent has proven to be at least somewhat fungible. Many of the people named ambassador, having earned distinction in another field, have been able to adapt to their new tasks surprisingly well. They have also effectively drawn upon the expertise of a permanent staff of secretaries and counselors at the embassy. Most important, as short-term appointees, with no thought of making diplomacy a life’s work, they have felt sufficiently liberated from executive control to either challenge or outright disobey orders they deemed counterproductive, and this has almost always redounded to America’s benefit. The United States would have been worse off—weaker, smaller, poorer, and less secure—had individuals like Henry Cabot Lodge not broken ranks. Seth Jacobs is professor of history at Boston College and the author of America’s Miracle Man in Vietnam: Ngo Dinh Diem, Religion, Race, and U.S. Intervention in Southeast Asia, 1950-1957 (Durham: Duke University Press, 2005), Cold War Mandarin: Ngo Dinh Diem and the Origins of America’s War in Vietnam, 1950-1963 (Lanham: Rowman & Littlefield, 2006), and The Universe Unraveling: American Foreign Policy in Cold War Laos (Ithaca: Cornell University Press, 2012). The Society for Historians of American Foreign Relations has honored him with two Bernath Prizes: for best article published in the field of U.S. diplomatic history (2002) and best book (2006). He won the New England Historical Association’s James P. Hanlan Book Award in 2013. Cited in Elise Viebeck, “Trump’s First 100 Days: Get with the Program or Get Out,” Washington Post, 30 January 2017. Seth Jacobs, Rogue Diplomats: The Proud Tradition of Disobedience in United States Foreign Policy (Cambridge University Press, forthcoming). Anne Gearan and Sean Sullivan, “Nikki Haley Departs Sharply from Trump on a Range of Foreign Policy Issues, Including Russia,” The Washington Post, 18 January 2017. Cited in Michael Brendan Dougherty, “Trump’s Uncontrolled Foreign Policy,” National Review, 10 May 2017. Cited in Lou Cannon and Carl M. Cannon, Reagan’s Disciple: George W. Bush’s Troubled Quest for a Presidential Legacy (New York: Public Affairs, 2007), 109. Adams to Hughes, 22 June 1818, Writings of John Quincy Adams, ed. Worthington Chauncey Ford (New York: Macmillan, 1916), 6:357. Ironically, Adams himself served for much longer periods of periods of time as minister to Britain, Russia, and Prussia without need of any such cultural delousing. Speech by Representative Warren R. Davis of South Carolina, 30 April 1834, Register of Debates in Congress (Washington: Gales and Seaton, 1835), 10:3879-3880. Speech by Senator William E. Robinson of New York, 10 January 1885, Congressional Record (Washington: U.S. Government Printing Office, 1885), 16:613-615. Cited in Thomas Bailey, A Diplomatic History of the American People, Seventh Edition (New York: Appleton-Century-Crofts, 1964), 43. Lewis E. Bollard, “America’s Shaky Ambassadors,” Harvard Crimson, 26 April 2006. Dennis C. Jett, “Those Ignorant Ambassadors,” Huffington Post, 26 February 2014. Cited in Nicholas Confessore and Sheryl Gay Stolberg, “Well-Trod Path: Political Donor to Ambassador,” New York Times, 18 January 2013. James Bruno, The Foreign Circus: Why Foreign Policy Should Not Be Left in the Hands of Diplomats, Spies, and Political Hacks (Canastota: Bittersweet House Press, 2014). Diary Entry, 18 February 1783, The Works of John Adams, Charles Francis Adams, ed. (Boston: Little, Brown, 1851), 3:359.